The Jardin des Sambucs is in Saint André de Majencoules in the Gard department in south-west France. 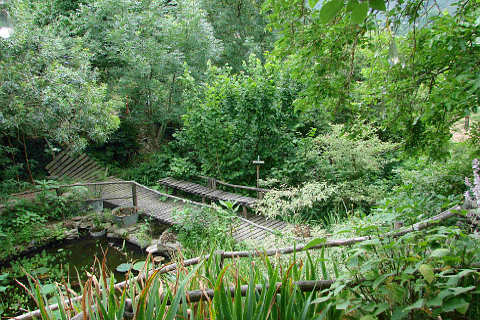 The garden is situated in the Cevennes National Park. The Jardin des Sambucs is a delightful and very natural garden where every effort is made to encourage insects, birds and small mammals. Water is a dominant feature and surrounding planting is a mixture of cultivated species with a lot of native plants, bushes and trees. Natural garden practices are also used in order to encourage the insect population. Most material from the garden is composted and nettles and comfrey are used to produce plant food. Garden furniture is also very natural being made of stones and pebbles with the use of cushions and swathes of material to add comfort and colour. You will be able to pick up lots of ideas for your own garden whilst admiring the different structures that have been built and which blend beautifully with the natural garden setting. The garden sits on a slope in a lovely valley setting surrounded by tree covered hills. The garden and setting are a delight. Feeling peckish? Each morning fresh herbs and vegetables are harvested from the potagers, cooked and served to visitors. The 'Croqu'jardins' meal costs 13 euros. Delicious! The garden opened in 2002 and by 2004 was awarded the 'Jardin Remarquable' or ' Remarkable Garden' status and the 'coup de coeur' award in 2013 by an association of French garden and horticulture journalists. The garden opens on the 16th April until the 18th September. April and May every weekend from 10.00-18.00 hours. June, July, August and September (to 14th) every day from 10.00-19.00 hours. Garden visits cost 7 euros for adults and 4 euros for children aged 5 and over. There is a lovely little cafe selling tasty meals and cakes made with products from the garden. There is also a gite and chambre d'hote if you wish to extend your visit to this charming garden and attractive area of France. Also in the Gard department is the Jardin de la Fontaine, which is the elegant public garden in the centre of Nimes. There is also the very colourful garden, the Jardin du Mas de l'Albri at Ponteils-et-Bressis which features roses and aquatic plants.